LSPI can destroy pistons and connecting rods, bringing an engine to a standstill in seconds. Original equipment manufacturers (OEMs) like General Motors (GM)* have addressed the issue by designing tests to gauge a motor oil’s ability to prevent these destructive events. Signature Series achieved 100 percent protection against LSPI1 in the industry-standard test. OEMs have been aggressively downsizing engines to meet strict fuel economy and emissions standards while improving power and torque. Most new engines today use some combination of turbochargers, direct-fuel injection and variable valve timing to make more power than their larger counterparts while delivering improved fuel economy. This scenario seems like all upside for drivers. But today’s smaller, hotter-running engines pose significant challenges to lubricants. The latest is a phenomenon called low-speed pre-ignition (LSPI), also known as “super knock,” which can destroy pistons and connecting rods. LSPI is another version of engine knock, which has been around since engines were invented. In this case, it occurs under low-speed, high-torque conditions in turbocharged gasoline direct-injected engines – like when you’re taking off from a stoplight. LSPI is the spontaneous ignition of the fuel/air mixture prior to spark-triggered ignition. This form of pre-ignition is more destructive than typical engine knock. Just as your engine relies on a balanced network of components to function, the motor oil needed to protect it requires additives with the right qualities at the right quantities. While adding more of one ingredient or reducing another seems simple enough, small composition changes can have big impacts. We were determined to find a solution to the LSPI problem without sacrificing the performance of Signature Series in any way. OEMs like GM have addressed the issue by designing tests to determine a motor oil’s ability to prevent LSPI. The GM LSPI Test records the number of peak pressure events during high-load operation in a turbocharged engine over a five-hour period. Passing the test is required to meet the GM dexos1® Gen 2 specification. We armed Signature Series with an advanced detergent system that protects against harmful deposits and LSPI. Signature Series Motor Oil achieved 100 percent protection against LSPI in the engine test required by the GM dexos1 Gen 2 specifications – zero occurrences were recorded throughout five consecutive tests. API SN PLUS is a recently released specification that was requested by the automobile industry to protect passenger vehicles from LSPI. AMSOIL anticipated this change, and the current formulations of Signature Series, XL and OE synthetic motor oil all meet or exceed the specification. Look for updated product labels featuring the new API “donut” in the near future. Your customers can be confident that AMSOIL synthetic motor oils protect their modern engines against LSPI, helping their vehicles deliver years of reliable service. For more information on the dangers of LSPI, visit www.amsoil.com/lspi. Example of piston damage due to an LSPI event observed during the testing of a competitor’s motor oil. The red arrows indicate sections of the ring land that have broken away from the piston. Is There Really an Advantage with Premium Gas? OCTANE EXPLAINED: DOES PREMIUM, HIGH-OCTANE GAS BOOST PERFORMANCE? A recent AAA report found that American motorists wasted $2.1 billion in the last year buying premium gasoline for engines designed to run on regular gas. When motorists see premium 91-octane gas at the pump, they may assume it contains higher energy content compared to regular 87-octane gas. After all, “high-octane” is often synonymous with increased power and performance. The 91-octane gas should, they think, provide improved fuel economy and power. On an engine’s intake stroke, the piston travels down the cylinder, allowing air/ fuel to fill the available space. Assume the cylinder holds 900cc when the piston is at bottom dead center. The piston then travels up the cylinder, compressing the fuel/air in preparation for combustion. 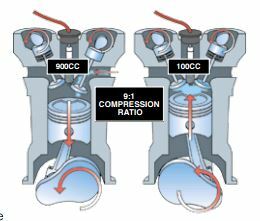 Assume cylinder volume is reduced to 100cc when the piston is at top dead center. The relationship between the two volumes is known as the compression ratio. In this case, 900:100 is reduced to 9:1. The compression ratio indicates cylinder pressure, and more pressure equals more power and greater efficiency. That’s why high-performance cars and heavy-duty diesels typically have higher compression ratios than standard cars or trucks. While higher compression seems like all up-side, it can invite negative consequences. Compression heats the fuel/air mixture, allowing it to burn more efficiently. If compressed too much, gasoline can ignite too early, causing uncontrolled and early ignition. This leads to a knocking or pinging sound, robs the engine of power and can lead to engine damage. Typically, the engine’s computer will detect engine knock and adjust timing and the air/ fuel ratio accordingly. Although this protects the engine from damage, it can substantially reduce engine performance and efficiency. Most high-compression gas engines require use of premium gas to better resist engine knock and prevent the computer from detuning the engine to protect against knock-related damage. Using premium gas in a clean, mechanically sound engine not designed to use it, though, provides no benefit. In engines with carbon buildup on pistons or in the combustion chamber, however, premium gas can provide some benefit. Deposits can reduce cylinder volume at top dead center, effectively increasing the compression ratio. This alone can lead to engine knock. The deposits can also become hot spots that preignite the mixture, leading to engine knock. In these cases, a higher octane fuel helps resist engine knock and allows the engine to operate closer to its normal conditions rather than detuning to prevent engine knock. For best performance, use the fuel recommended in your vehicle owner’s manual. While many formulators market a highquality premium gasoline, such as Shell* V-Power* Nitro+ or ExxonMobil* Synergy*, the premium gasoline at your local filling station may not be formulated to improve performance in any aspect other than octane rating. Quality can vary from brand to brand and station to station. This is why we sell AMSOIL P.i.® (API) for cars and trucks and AMSOIL Quickshot® (AQS) for smaller engines. They provide excellent detergency to help clean dirty injectors and carburetors for maximum fuel economy and operability. Once you understand the truth about premium gas, these additives will better assist in overall performance thus giving better peace of mind and benefits you’re seeking. 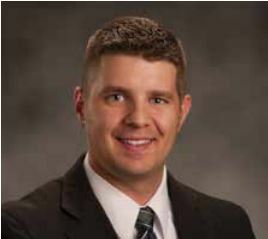 Motor oil quality must stay ahead of the curve. It may be a good time to invest your retirement funds in a company that builds automotive turbochargers; they’re predicted to be in most new passenger cars/light trucks by 2020. As such, we’ve focused quite a bit of time and energy on turbos and the challenges they present to motor oil. Today, I want to dive a little deeper into turbo tech and explain how they work and why AMSOIL will be synonymous with the subject of turbos in the coming years. An engine is essentially an air pump, and the more air it ingests, the more fuel it can burn – and the more power it can produce. There are a few ways to increase the amount of air the engine takes in, but turbocharging has emerged as the favored choice of automakers. As shown in the diagram, exhaust gases commonly exceeding 1,000ºF spin a turbine, often at more than 150,000 rpm, which drives the compressor that draws ambient air used to pressurize the combustion chamber. The added oxygen combined with direct injection and advanced engine-tuning helps the engine burn fuel more efficiently, boosting fuel economy. It also allows the engine to burn more fuel for increased power. As a result, a turbocharged four-cylinder engine can make as much power as a non-turbo six-cylinder engine. This advancement allows automakers to build vehicles with smaller, lighter engines that don’t sacrifice power or torque. Motorists enjoy the performance and fuel economy they demand, while automakers meet increasingly strict CAFE (Corporate Average Fuel Economy) requirements. A win-win situation. As they say, there’s no such thing as a free lunch, and in this case, it’s the motor oil that ends up footing the bill. 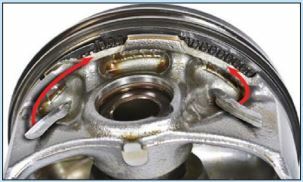 The turbo’s center section contains an oil-lubricated bearing. The tremendous heat and stress turbos create can cause some oils to break down and form harmful bearing deposits, known as turbo coking. Over time, turbos can suffer reduced performance, or fail altogether. For this reason, auto manufacturers and oil companies – including AMSOIL – automatically include turbocharged vehicles in their severe-service category when prescribing oil-change intervals. The TEOST 33C Test (ASTM D6335), an industry-standard bench test that simulates turbocharger operating conditions, has taken on added importance in today’s automotive landscape. With the predicted rise in turbo use, it’s more important than ever for motor oils to protect against harmful high-temperature deposits to keep vehicles running properly. To meet the API SN Resource Conserving and ILSAC GF-5 motor oil specifications that are often recommended by vehicle manufacturers, a 5W-30 motor oil must limit total deposit formation to 30 mg or less in the TEOST Test. In our recent published tests (deposits caused by lower quality base stocks in turbo equipped engines), AMSOIL Signature Series 5W-30 Synthetic Motor Oil held the total weight of deposits to 7 mg, well under the 30 mg limit required by the API and ILSAC, while Royal Purple® API 5W-30 and Mobil 1® Extended Performance 5W-30 came in just under the limit at 25.4 mg and 28.2 mg respectively. Signature Series 5W-30 Synthetic Motor Oil protects against harmful deposits on turbochargers 4X better than Mobil 1® Extended Performance and 3.6X better than Royal Purple® in industry-standard testing*. We want our customers to understand the importance of protecting their turbocharged vehicles, and to know AMSOIL is devoted to offering protection beyond what is required by the industry. We are the only name for true automotive enthusiasts here in Sioux Falls! *Based on independent, third-party testing of AMSOIL® Signature Series 5W-30, Mobil 1® Extended Performance 5W-30 and Royal Purple® API 5W-30 in the ASTM D6335 bench test required by the API SN Resource Conserving specification. For full test details visit www.amsoil.com/depositprotection.